Easter egg trees are fun projects for the whole family, but there are times when you want to do something elegant and crafty just for yourself to satisfy your inner “Martha”. 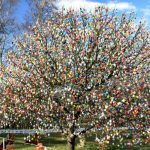 Making Easter egg trees with the grand-kids was fun but I wanted some inspiration for a grown up tree so I started looking around the web and found some Easter Egg Trees that would be fun to try. To go to the website for tutorials and instructions to make your own tree, just click on the any of the Easter Egg Trees images below. It’s a good idea to plan your elegant Easter egg tree well in advance of the holiday. I found working on it to be a nice way to while away the long depressing Maine winter that seems to take forever to leave after the cheerfulness of the Christmas holiday. Which of these Easter Egg Trees is your favorite? My favorite is the first one, by Martha Stewart (of course). I just love it but it won’t happen this year, as it is a project you would have to start way ahead of time. There is tremendous detail and the components are darling. It looks like a lot of work but it is so sweet and for me, it’s worth the effort. So I am planning on that one for next year! I also love #2 by Dian Thomas. That one might be a little more doable for me this year. This Easter egg tree is fairly frugal with inexpensive components like felt and feathers. It would even be a fun project to do with a tween girl. When I look at #3 by Our 7 Dwarfs, I see sophisticated, clean, and simple lines. 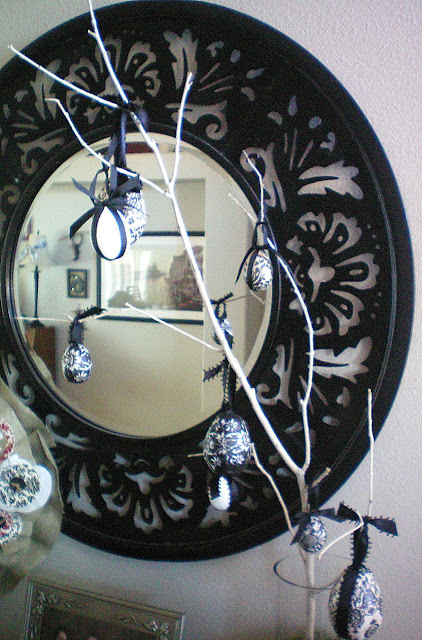 What’s great about this one is it’s a very quick solution using reasonably priced items purchased at JoAnn’s Fabrics. 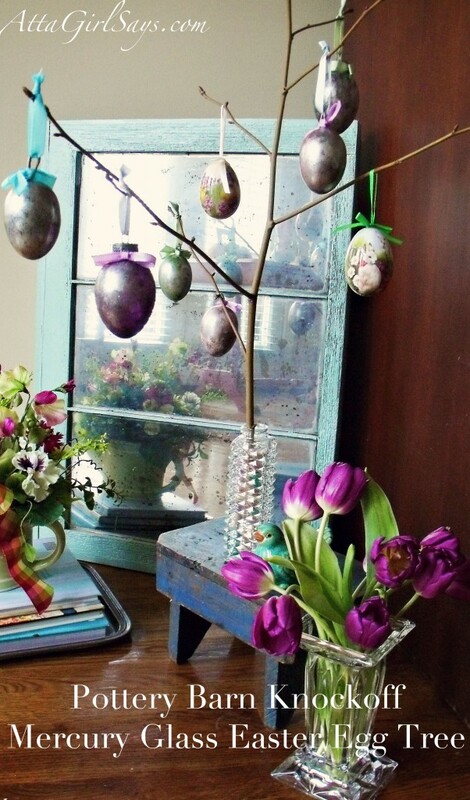 You don’t need much time or money to come up with a very stylish Easter Egg tree that will fit any decor. Now #4 is a possibility for me as I do have a reproduction feather tree but mine is green. I really like the white one for this project from LDS Living better. It gives a very glam look to this Easter Egg tree and shows the ornaments off nicely plus it gives a feeling of nostalgia using the classic feather tree. Craft-O-Maniac takes the prize for drama in #6. Talk about “WOW” factor! Good old Modge Podge! Men may have their duct tape – the handy man’s secret weapon- but we girls have our Modge Podge and it provides infinite possibilities in crafting. I’d like to find some tissue that looks like sheet music. That would be a great covering for some paper mache eggs. This one gives me all kinds of ideas. #7 is by Diane Faw, who has incorporated a number of crafting techniques to decorate the eggs for this tree. 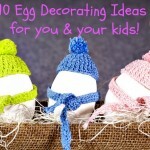 If you are looking for some unique ideas and a variety of egg decorating techniques, check out her post. She uses painting, mosaics, decoupage just to name a few of the myriad of crafting possibilities employed in decorating her tree. And #8 is a Pottery Barn knock off from Atta Girl Says….a great idea that I would love to have in my entry way. So which of these Easter Egg Trees is your favorite? Which one inspires you to get our your paint brushes, glue gun, and Modge Podge? I have to admit that my favorite is the elegant Martha Stewart tree at the beginning of the post but more likely I will accomplish a less complicated Easter Egg Tree like #4 from 7 Dwarfs. I trying to be realistic here but I can aspire to “Martha-hood”! Comment below and let me know which one you like! I have been looking for instructions on how to make Martha Stwarts feather Easter egg tree. Can anyone help me? What fun! I love Easter egg trees! Thanks for sharing at Pinworthy Projects. I adore the “Martha” tree, too! Now I have a reason to go search out the after-Easter sales! I’d love to have you link your post to Seasonal Sundays. The link goes up at 7 pm on Saturday evening. This is a great collection of Easter trees! Thansk for linking up to Talkin’ about Thursday! I love the sweet floweret and martha stewart one! They are all beautiful though! So festive! I just love Easter! Love the Easter trees!! I decorate trees for every holiday and I mean full size trees at times. I currently have a 6 foot white Easter tree in the Living Room and a 4 foot pink Easter tree with a Bunny village in the Dining Room. I had 2 7 foot Valentine’s Day trees….. They sound so festive! Decorations are so important to the mood of a holiday. I love martha’s tree! But they are all beautiful! Thanks for all the inspiration. I love egg trees! Great inspiration here! Thanks for sharing and linking this up to Give Me The Goods Monday! Number 3 is my favorite. As a mom of two young kiddos I know that they would love the fun and whimsical nature of the hatching chicks and bunnies. Thanks for including my Easter Egg tree in such wonderful company. For our family, it is a long-standing tradition and the collection has grown egg-by-egg over many years. I love Egg trees…I made one last year and have it on my bedroom desk and have another in the kitchen and the base is a cupcake…should send you pictures so next year you could include them in your parade, lol…channeling my inner Martha! Thanks for posting! I came hopping over from Small Things with Love party! have a great week! Do that! I would love to see the picture and would love to use it next year in my egg tree round up! All of the Easter Egg trees you showed us are wonderful. I have made an Easter Egg tree every year for many years. In past years, I used a tree branch, but this year I used a purchased tree made of glittered wire. The tree branch had a more natural, old fashioned look. The glittered wire tree has more limbs for eggs and it is very symmetrical. 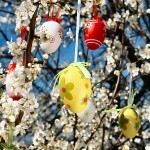 I liked the basket and little Easter creatures on Martha’s tree.I may try to make some of them for my tree next year. 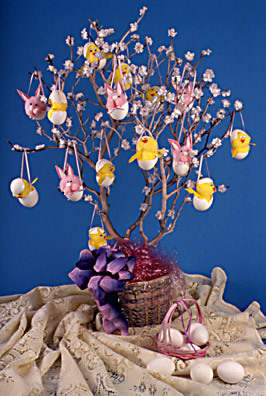 There is a picture of my Easter egg tree on my blog if you’d like to see it. Thanks for showing us so many beautiful Easter egg trees. Those are all so beautiful, but if I had to choose it would of course be #1. Numbers 3 and 4 are a close second. I don’t think I will have the time to make one this year either, but would love to make one for next year.